"TO: Presidential Electors, Edward T. Schafer, Rosemarie Myrdal, and Bryce Streibel. FR: Al Jaeger, Secretary of State. RE: Meeting of Electors - Photograph. 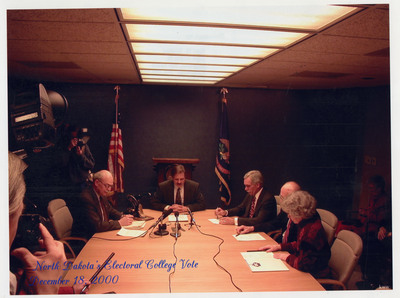 Kurt W. Webber of Bismarck provided the enclosed photograph, which was taken at the meeting of the North Dakota Electoral College on December 18, 2000. Thank you for making that day a very memorable one in our state's and nation's history." Prior to being elected North Dakota Governor, Ed Schafer unsuccessfully challenged North Dakota Congressman Byron Dorgan in 1990. Two years later, Schafer, a Republican from Bismarck, won the gubernatorial election and served as North Dakota’s 30th Governor until 2001. A Republican from Bismarck, John Hoeven was the president and CEO of the Bank of North Dakota before entering politics. He succeeded Ed Schafer as North Dakota Governor and served from 2001 until 2010, when he was elected to the US Senate.